Carol A. Taylor is a Texas poet whose work has appeared or is upcoming in a number of print and online journals, including Light Quarterly, Iambs & Trochees, Rattle, First Things, Per Contra, 14 by 14, The Barefoot Muse, Susquehanna Quarterly, Lighten Up Online, Trinacria, Tilt-a-Whirl, Concise Delight, and Umbrella Journal, and in several print anthologies She has put out three chapbooks, "Saving for the Future" 2003, "Houston Skyline" 2006, and a bilingual collection of sonnets, "Sonetos del Inglés" in 2011. Other credits include guest-editing the Fall-Winter 2002 issue of Light Quarterly which featured an anthology of classic jokes written into original poems collected and edited by Carol and fellow poet Tim Murphy, and serving as Administrator of the online workshop Eratosphere from 2001-2007 and as Light Verse Editor of Umbrella Journal's Bumbershoot division from 2006-2008. Her poem “Texas Is Singing” became the text for a choral and orchestral piece of the same name by Texas composer Randol Bass. Carol enjoys rhyme and form and writes almost exclusively in meter. 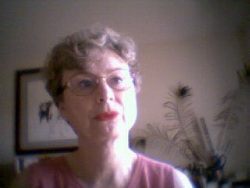 She currently administers the online metrical workshop Poet & Critic at www.poetandcritic.com. Officially retired, she is a free-lance translator, sings with the Texas Master Chorale, and does volunteer work. A kindness, Deborah—is that all it was? whose doubts about himself you understood? be kind, remembering? Was that enough? neglected in your closet all those years? of that cold man for just a little while? but was it worth it? Tell me, Deborah Kerr. would you still offer tea and sympathy? For permission to publish or otherwise share this poem, please contact Carol. Tea and Sympathy was first published in Alsop Review Print Anthology in 2004.
right fender for a ‘69 Corvair. The lid’s unhinged; the washer drum won’t spin. this deacon of the worn-out One-Hoss Shay. “Why should one part be stronger than the rest? the fan, the fence, a bike, a cuckoo clock. just like it was the day before it broke. Handy Man was first published in Umbrella Journal in Winter 2006.
cut the grass next week. Fog forms on cold glass. fills my small red car. Tomball, West of Tokyo was first published in Conversing with Poetry's print anthology in 2010. I’m making puttanesca from a jar. I’d rather spend my time in Guido’s bar. My mother came from Rome before the war. except when canning for St. Anne’s bazaar. (you can get them still in Guido’s bar). don’t hang out most nights in Guido’s bar. clean up the pans or write a villanella. put on some heels, and head for Guido’s bar. Villanella was first published in The Barefoot Muse in December 2007.